In-Depth Preview of the Aurora Greenmen at Louisville Leopards DIII Regional Quarterfinal Playoff Football Game Friday along with a look at the Leopards playoff history. Connor Zwick accounted for 208 yards of offense and 2 touchdowns and Walter Schrock finished with 72 yards rushing and 2 touchdowns to lead Louisville to a 42-21 win at Canton South. An In-Depth preview of Friday’s Rivalry Week Matchup between the visiting Louisville Leopards and the host Canton South Wildcats. Also a look at the all-time series and past highlights. 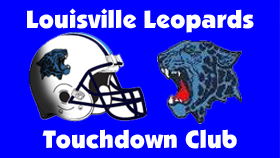 An In-Depth Preview of the Week 8 matchup between the visiting Marlington Dukes & the host Louisville Leopards. Also, past highlights and a look at the all-time series. An In-Depth Preview of the Louisville Leopards at West Branch Warriors Football game Friday along with past highlights and all-time series. In-Depth breakdown of Friday’s game between the Carrollton Warriors and the Louisville Leopards. Also Past Highlights and All-Time Series Results.